Wardrobes have come a long way, thanks to people realising that they are so much more than just handy clothing storage devices. 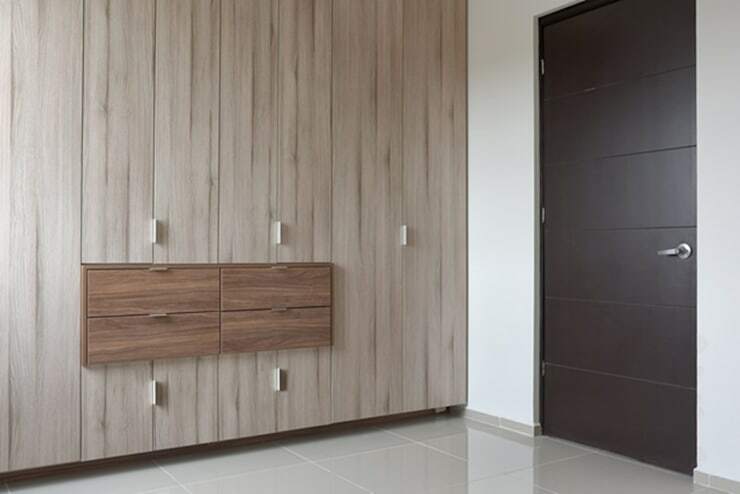 We think you'll be really tempted to invest in a seriously stylish wooden closet, once you've seen the examples that we have to show you today! Interior designers have long understood what a dramatic impact that the right wardrobe can have on a master bedroom, hence they have curated some of the most engaging, beautiful and covetable styles that we have ever seen! If you've been thinking about upgrading your wardrobe, take a look at these pictures and see if we can persuade you that wood is a great way to go! 1. More than a closet. Wow! 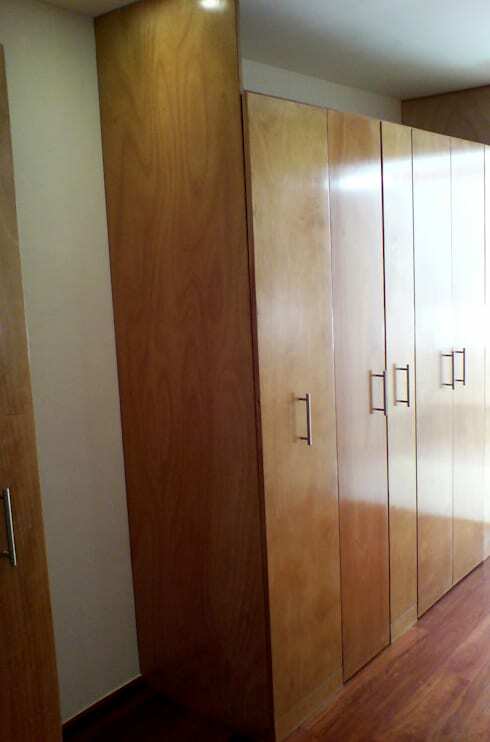 To call this a mere wardrobe would be an insult to the maker, as we think it is a lifestyle organisation solution! Taking up the lion share of a wall, it offers a variety of storage, with drawers, cabinets, rails and shelving all in place, and looks phenomenal too, thanks to the rich wood finish! Those frosted doors are amazing! 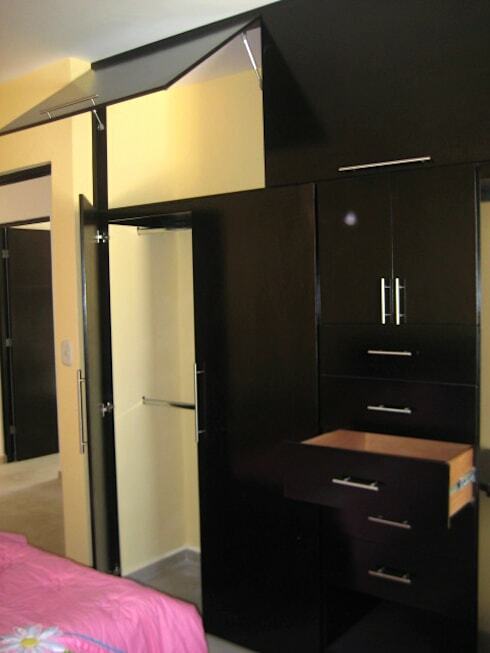 A little black wood goes a long way and this small but functional wardrobe has caught our eye for a number of reasons! Firstly, it looks gorgeous, but add in the fabulous levels of functionality and suddenly you have a piece of furniture that will stand the test of time and continue to be the perfect solution to clothing storage conundrums! Here's a wardrobe for all you shoe fanatics out there! Slide one of the full height doors open and you reveal this incredible facility that can house as many shoes as you dare to buy, then open the other side and you have drawers and rails for all your clothes! It certainly doesn't hurt that the doors here are amazing to look at too! 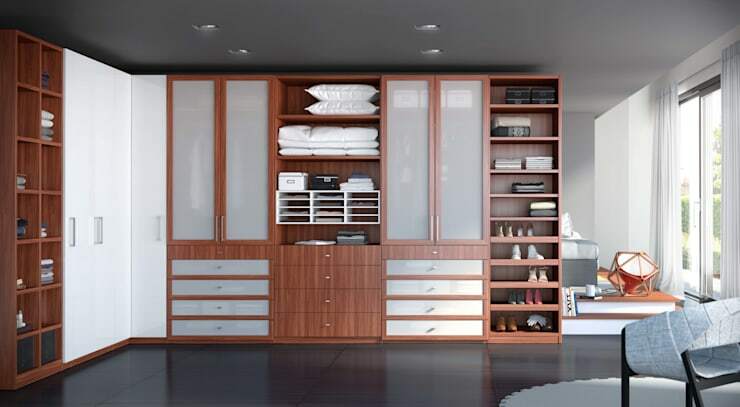 When you need a lot of wardrobe space, choosing a built-in option makes perfect sense and when style need to play a part too, wood is the best bet! The amount of hanging space here is utterly mind-blowing and with sleek modern handles, the sacrificed room space is minimal. Wow! 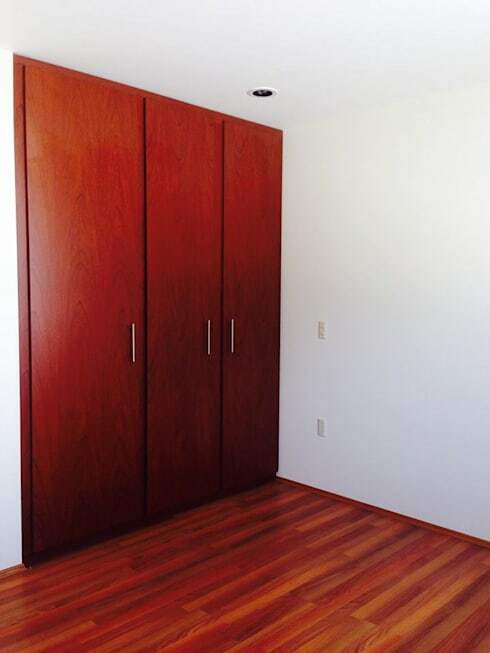 For a contemporary built-in wardrobe look, pale ashy woods can be a great choice! We are fascinated by the door additions here, which we assume are pull-out drawers for accessories and as a whole, the look of this unit is incredible! Just look at how tall it is! There must be endless shelves and rails inside! 6. Focus on the grain. 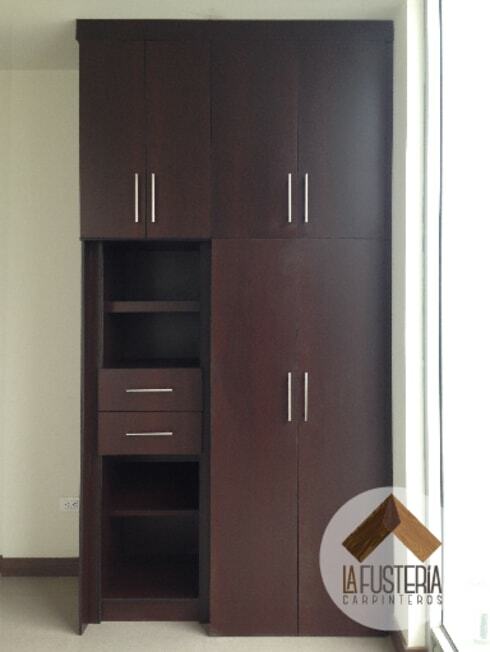 For wood enthusiasts, we think this is the perfect wardrobe design, as it is a custom piece that has been made by a carpenter, to take advantage of the gorgeous natural wood grain of the variety selected! As a custom piece, it fits perfectly in the space and caters to every specific need inside as well! 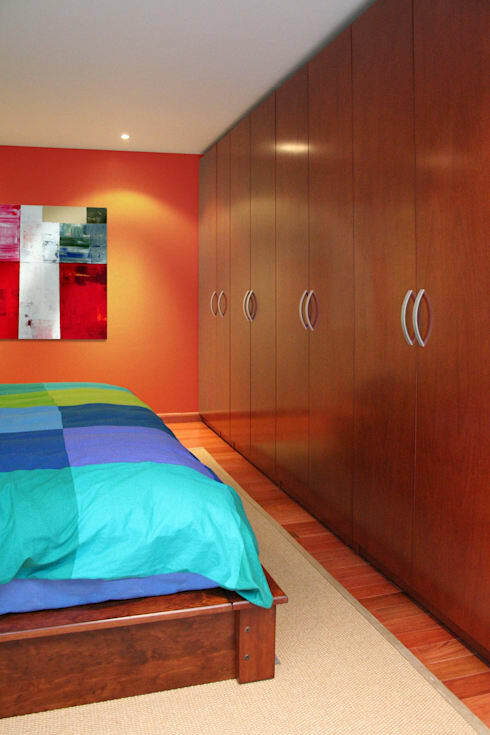 The red-brown hue of this wood has certainly made for en eye-catching installation, but it's not all just good looks! With a hanging closet, drawers, top cupboards and inset shelves all present, there is functionality at the very heart of this tremendously fashionable piece of furniture! Now here is a great idea! Choosing a wardrobe that can be extended to include bookshelves and a desk means that you'll never struggle to maintain the balance of storage, style and practicality again! 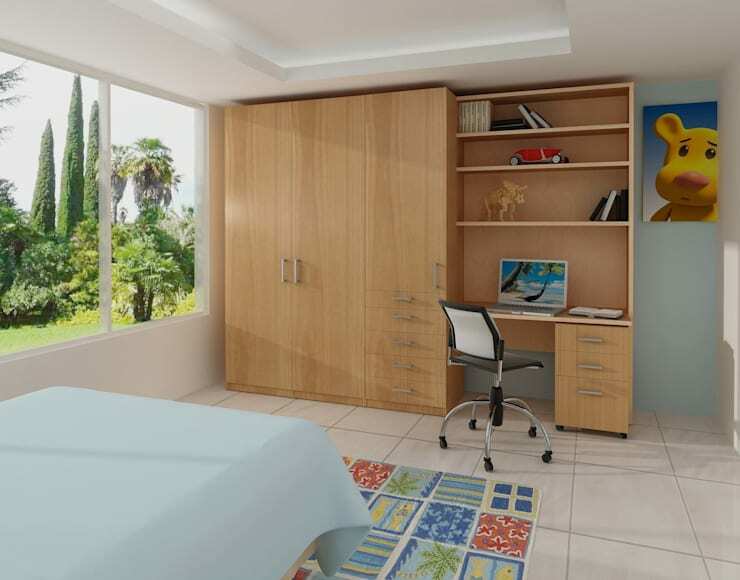 This is ideal for a teen's room, but make sure they actually hang their clothes back up! You know how lazy they ca be! 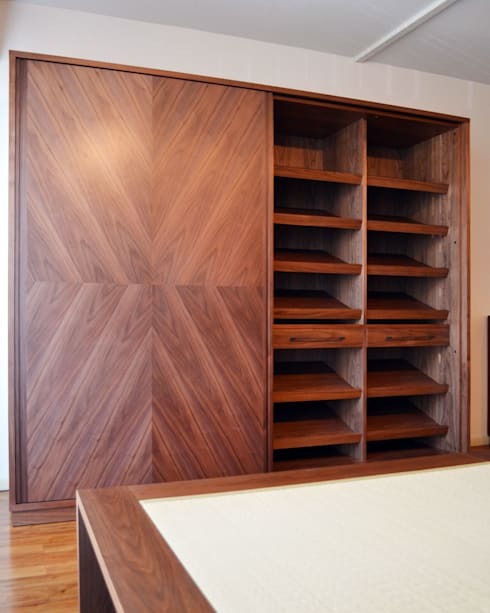 The wood used here is so glossy that it really makes the vast wardrobe itself stand out and with simple contemporary handles in place, it feels traditional, elegant and yet modern, all at the same time. Extending the end panels up to the ceiling was an ingenious touch, as it has created extra storage space on top of thew wardrobe itself! Ideal for hat boxes! 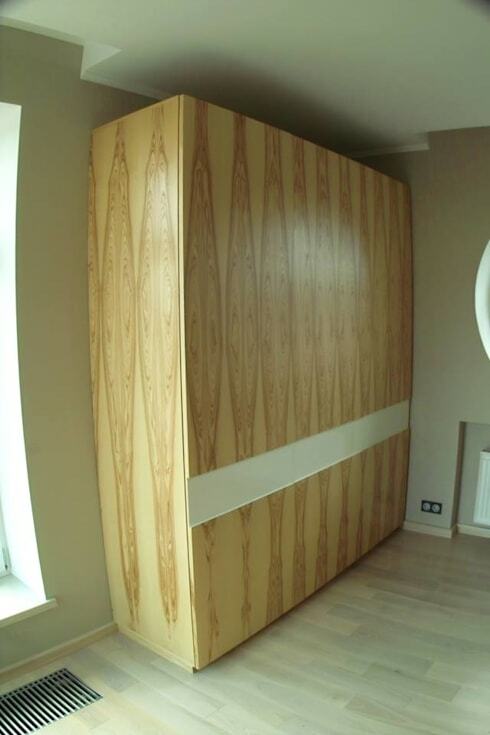 We love the considered design here that has seen a sleek modern wardrobe finished in a wood that perfectly matches the floor! Talk about helping to integrate and camouflage the furniture! The bedroom actually looks bigger, thanks to the clever technique and the triple door design means there's plenty of easy access to clothing too. Fantastic! For more wardrobe inspiration, take a look at this Ideabook: 16 life-improving tricks for those with little wardrobes. Which of these styles really grabbed your attention?